This article originally appeared in the winter/spring 2018 issue of The Twig, our 24-page member newsletter. To read more from this issue, click here. To become a member and receive The Twig in the mail, become a member. For days the sun shone and the weather was warm. There was no frost on the windows in the mornings. All day the icicles fell one by one from the eaves with soft smashing and crackling sounds in the snowbanks beneath…Then one day Laura saw a patch of bare ground in the yard. All day it grew bigger, and before night the whole yard was bare mud…That night Laura woke up, shivering. The bed-covers felt thin, and her nose was icy cold…Pa came in, shaking the soft snow from his shoulders and stamping it from his boots. “It’s a sugar snow,” he said. Following the chapter “Sugar Snow” is “Dance at Grandpa’s.” The fiddle strings were readied for Pa’s rendition of “Buffalo Gals” and other dancing tunes as friends and family celebrated the maple syrup season. The skirts swirled and the boots stamped, Wilder wrote. Once the syrup was waxing, the partygoers filled plates with snow and Grandma poured hot syrup on the snow to make a soft candy. 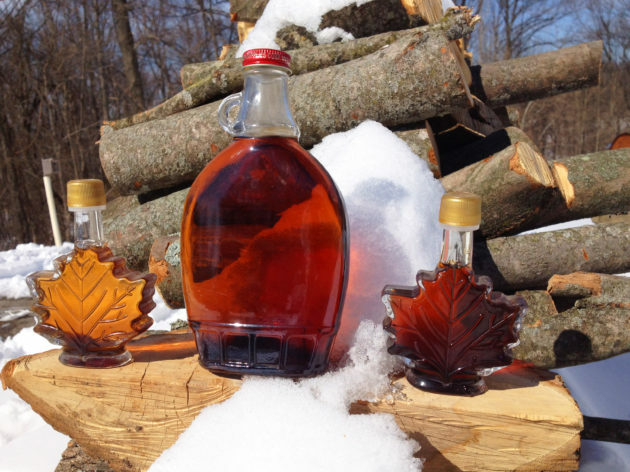 My sons, now 15 and 13, have helped make maple syrup almost every year of their lives – tapping trees, collecting sap, starting a fire, and licking clean the pots of sweet syrup. My youngest and I make maple frosting; maple cheesecake is a favorite desert; and the adults love a sap-bucket highball. Here are some of my family’s favorite recipes from the Michigan Maple Syrup Association’s cookbook, but I encourage you to get creative and try your own! Slowly cream butter with powdered sugar. Add maple syrup until desired consistency is reached. Mix all ingredients in a blender, pour into glasses, and serve. In a small bowl, combine graham cracker crumbs and butter. Lightly butter a 9-inch spring-form pan. Dust the sides with crumbs, and press the rest into the bottom of the pan. Chill in the fridge. In a large bowl or stand mixer, beat the cream cheese well, adding eggs one at a time and beating after each addition. Add salt, maple syrup, and 1 ½ tsp vanilla. Beat well. Pour wet ingredients into chilled crust. Bake 45-50 minutes, or until firm. Combine sour cream, honey, and 1 tsp vanilla. When cake is firm, pour sauce on top, then bake for 5 more minutes at 400° F.
Chill overnight. Drizzle maple syrup over each piece before serving.